We warmly welcome you to the church in Cerritos. 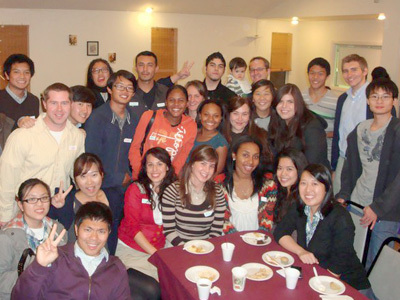 We are believers in Jesus Christ from all backgrounds who gather locally to be the Lord’s testimony in Cerritos. We have listed some frequently asked questions below. Read through some of our responses to these questions or ask us a question of your own using the form at the bottom of the page. I’m looking for fellowship. Can someone visit me or call me? Yes, ministering to families, including children and teenagers, is an important part of our responsibility and stewardship. Most of our meeting venues have comfortable facilities for children and teens, and we typically have age-appropriate classes or sessions each Sunday. See the Children and Young People pages for more information. You should expect a warm welcome and to meet some joyful Christians. We love to sing with our heart to the Lord and to speak to one another in psalms and hymns (Eph.5:19Speaking to one another in psalms and hymns and spiritual songs, singing and psalming with your heart to the Lord,). Our gatherings are characterized by mutuality: we encourage praise, prayer, and speaking from one another (1 Cor. 14:26What then, brothers? Whenever you come together, each one has a psalm, has a teaching, has a revelation, has a tongue, has an interpretation. Let all things be done for building up.). Our meetings are frequently punctuated by “Hallelujah!”, “Amen!”, “Oh Lord Jesus!” and other joyful noises to the Lord (Psa. 100:1Make a joyful noise to Jehovah, all the earth. ; 1 Thes. 5:16Always rejoice,; Phil. 2:11And every tongue should openly confess that Jesus Christ is Lord to the glory of God the Father.). If your worship style is more meditative, you will also feel comfortable meeting with us. We are not for any particular outward form, practice, or liturgy. Our only goal is to worship the Lord in spirit and truthfulness (John 4:24God is Spirit, and those who worship Him must worship in spirit and truthfulness.). God’s intention is that all of His believers would serve Him as priests (1 Pet. 2:5You yourselves also, as living stones, are being built up as a spiritual house into a holy priesthood to offer up spiritual sacrifices acceptable to God through Jesus Christ.). All Christians have the innate capacity to contact God, worship God, be filled with God, pray to God, speak for God, and represent God (Acts 1:8But you shall receive power when the Holy Spirit comes upon you, and you shall be My witnesses both in Jerusalem and in all Judea and Samaria and unto the uttermost part of the earth. ; 1 Cor. 14:31For you can all prophesy one by one that all may learn and all may be encouraged. ;1 Pet. 2:9But you are a chosen race, a royal priesthood, a holy nation, a people acquired for a possession, so that you may tell out the virtues of Him who has called you out of darkness into His marvelous light;; Rom. 1:9For God is my witness, whom I serve in my spirit in the gospel of His Son, how unceasingly I make mention of you always in my prayers,). Of course, the ascended Christ has given gifts to the Body which we treasure, including apostles, prophets, evangelists, and shepherds and teachers (Eph. 4:11And He Himself gave some as apostles and some as prophets and some as evangelists and some as shepherds and teachers,). There are many who serve as shepherds and teachers among us, including the elders of the church, along with others who have the spiritual gift of shepherding and teaching (1 Pet. 5:1-3Therefore the elders among you I exhort, who am a fellow elder and witness of the sufferings of Christ, who am also a partaker of the glory to be revealed: Shepherd the flock of God among you, overseeing not under compulsion but dwillingly, according to God; not by seeking gain through base means but eagerly; nor as lording it over your allotments but by becoming patterns of the flock. ; Acts 20:28Take heed to yourselves and to all the flock, among whom the Holy Spirit has placed you as overseers to shepherd the church of God, which He obtained through His own blood.). We are not part of any denomination. We follow the New Testament pattern which shows Christ’s believers who congregate only on the basis of the locality in which they live (see Acts 8:1And Saul approved of his killing. And there occurred in that day a great persecution against the church which was in Jerusalem; and all were scattered throughout the regions of Judea and Samaria, except the apostles. ; 13:1Now there were in Antioch, in the local church, prophets and teachers: Barnabas and Simeon, who was called Niger, and Lucius the Cyrenian, and Manaen, the foster brother of Herod the tetrarch, and Saul. ; Rom. 16:1I commend to you Phoebe our sister, who is a deaconess of the church which is in Cenchrea,; 1 Cor. 1:2To the church of God which is in Corinth, to those who have been sanctified in Christ Jesus, the called saints, with all those who call upon the name of our Lord Jesus Christ in every place, who is theirs and ours:). Because we live in Cerritos, we meet simply as the church in Cerritos. As the church in Cerritos, we receive all of the believers in Cerritos, as Christ has also received us (Rom. 15:7Therefore receive one another, as Christ also received you to the glory of God.). Witness Lee and Watchman Nee are two of the most influential Christian ministers of the 20th century and the church in Cerritos has been a beneficiary of their ministry since our inception in 1962. They both stress the same general theme of the Christian’s experience of Christ as life for the building up of the Body of Christ in many practical ways. Witness Lee (1905-1997) was a prolific speaker and writer whose ministry produced and served over three thousand local churches worldwide. His monumental work, the Life-study of the Bible, comprises over 25,000 pages of commentary on every book of the Bible from the perspective of the believers’ enjoyment and experience of God’s divine life. These messages continue to bebroadcast in multiple languages worldwide across the radio and Internet. If your question has not been answered, feel free to use the form below and let us know how you would like to be contacted.